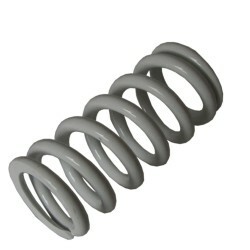 This 75Nm x 205mm shock spring, manufactured especially to fit the OEM WP shock on the 701 Enduro, is stiffer than the 69Nm spring fitted at the factory. This gives a much improved sag setting, for an average weight rider,up to 90Kg rider weight, and makes for a better ride, both on and off-road. NOTE: Although it fits with OEM plastic locknut, our CNC machined packer RRP 562 is needed if fitted with spring only. If the spring is fitted with our Remote Hydraulic Preload Adjuster RRP 563, then only the spring is needed.